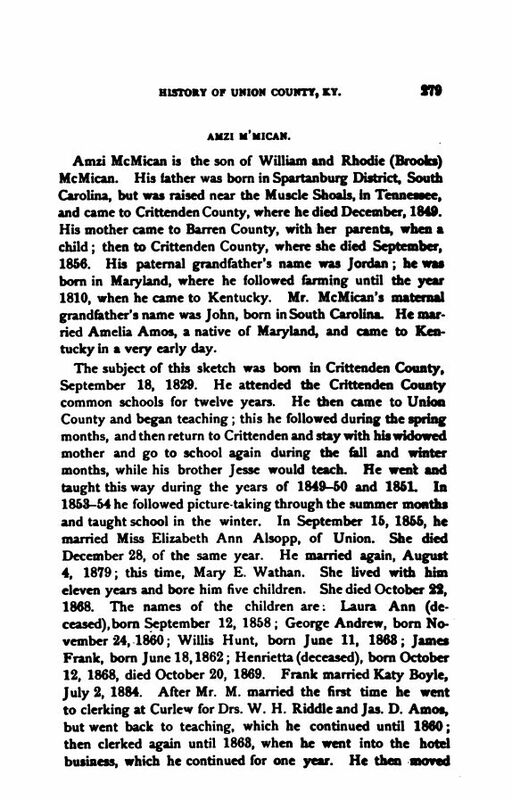 Amzi McMican is the son of William and Rhodie (Brooks) McMican. His father was born in Spartanburg District, South Carolina, but was raised near the Muscle Shoals, in Tennessee, and came to Crittenden County, where he died December, 1849. His mother came to Barren County, with her parents, when a child; then to Crittenden County, where she died September, 1856. His paternal grandfather's name was Jordan; he was born in Maryland, where he followed farming until the year 1810, when he came to Kentucky. Mr. McMican's maternal grandfather's name was John, born in South Carolina. He married Amelia Amos, a native of Maryland, and came to Kentucky in a very early day. The subject of this sketch was born in Crittenden County, September 18, 1829. He attended the Crittenden County common schools for twelve years. He then came to Union County and began teaching; this he followed during the spring months, and then return to Crittenden and stay with his widowed mother and go to school again during the fall and winter months, while his brother Jesse would teach. He went and taught this way during the years of 1849–50 and 1851. In 1853–54 he followed picture-taking through the summer months and taught school in the winter. In September 15, 1855, he married Miss Elizabeth Ann Alsopp, of Union. She died December 28, of the same year. He married again, August 4, 1879; this time, Mary E. Wathan. She lived with him eleven years and bore him five children. She died October 22, 1868. The names of the children are: Laura Ann (deceased), born September 12, 1858; George Andrew, born November 24, 1860; Willis Hunt, born June 11, 1868; James Frank, born June 18, 1862; Henrietta (deceased), born October 12, 1868, died October 20, 1869. Frank married Katy Boyle, July 2, 1884. After Mr. M. married the first time he went to clerking at Curlew for Drs. W. H. Riddle and Jas. D. Amos, but went back to teaching, which he continued until 1860; then clerked again until 1863, when he went into the hotel business, which he continued for one year. He then moved on a farm, which he followed for two years, from 1864 till 1866. He then went back to Curlew, where he was clerk and paymaster for the firm of T. A. Buckham & Co., for one year. After this he embarked in a business of his own, entering into partnership with A. R. Prince, which only lasted nine months under the name of McMican & Co. His second wife died shortly after this. He clerked for Leopold Harth for four or five months and went to teaching again, which he continued to do until 1879, when he retired from active life. He has served his district as Magistrate for one term, besides filling the vacancy of another half term. On May 11, 1883, he married his third wife, Mrs. Harriet Shipley, of Carmi, Ills. Mr. McMican's life has been one of practical business, which has served to stock his mind with useful information. In politics he is a Democrat, having been for many years one of the old reliable workers of the party. He has a convenient and picturesque residence in De Koven, upon a half-acre of land. 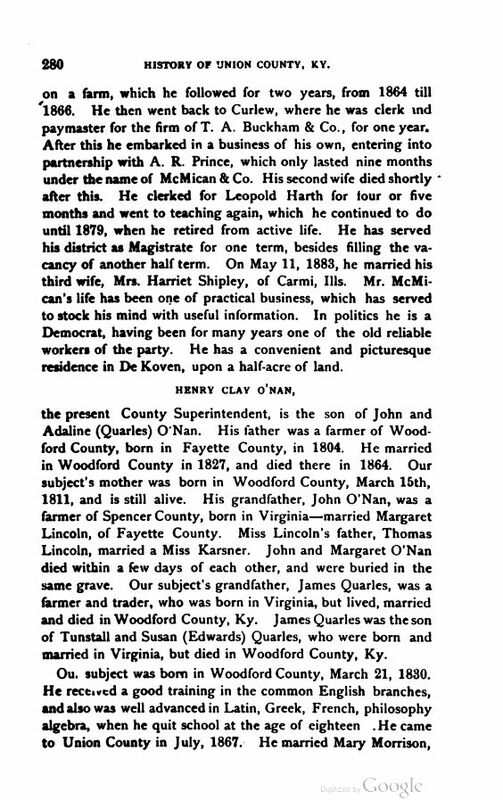 Source: "History of Union County, Kentucky", pp. 279-280, Courier Company Printers and Binders, Evansville, IN, 1886.